So this is not the first time we received a call from the nice ladies at Totem Ocean Trailer Express (TOTE) http://www.totemocean.com/ here in Anchorage. 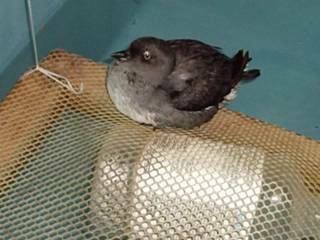 We have this bird that we found on one of our ships and it looks fine but won't fly. So we get it back to Bird TLC and find out it's a Cassin's Auklet. It's a water fowl bird that's not uncommon to the coast of Alaska. Chances are it got separated from it's flock, got tired while flying and decided to land on this huge steel island somewhere's between Tacoma, WA and Anchorage, AK. It's condition is fair. It's feet are a little rough from walking on the ship and it's tail feathers are a little worn also. In the picture it's in one of our water tanks. It needs to keeps the water proofing of it's feathers going. We also have feeder fish for it to dive for. Chances are it will be transferred to the Alaska Sealife Center in Seward http://www.alaskasealife.org/ real soon.